Zvezda is a Russian model/gaming company with an interesting line of very cheap ($3.95) models and some large miniature-combat board games. Their new release is an age of sail game called “”Armada Invencible.” This will release at Gen Con 2013 for a $69.95 MSRP. 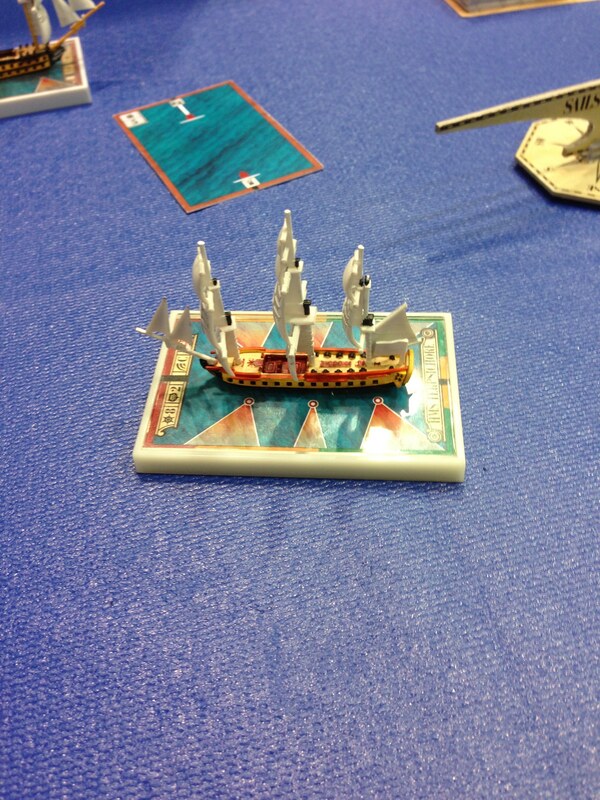 The ships come disassembled, but are snap together models. 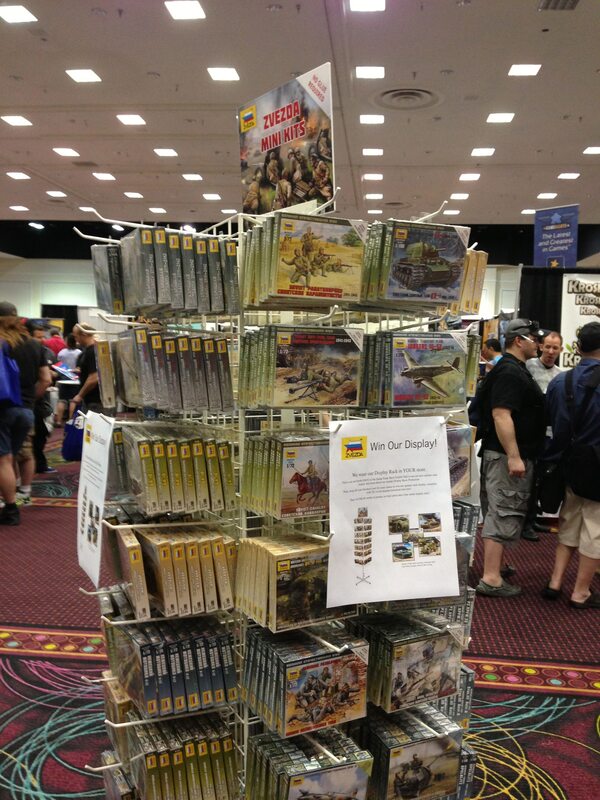 Zvezda is a model company at heart, so here is a shot of their store spinner display. 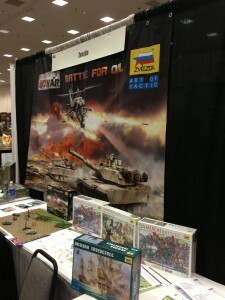 Another new release was “The Battle for Oil,” a modern combat simulator for the Middle East. 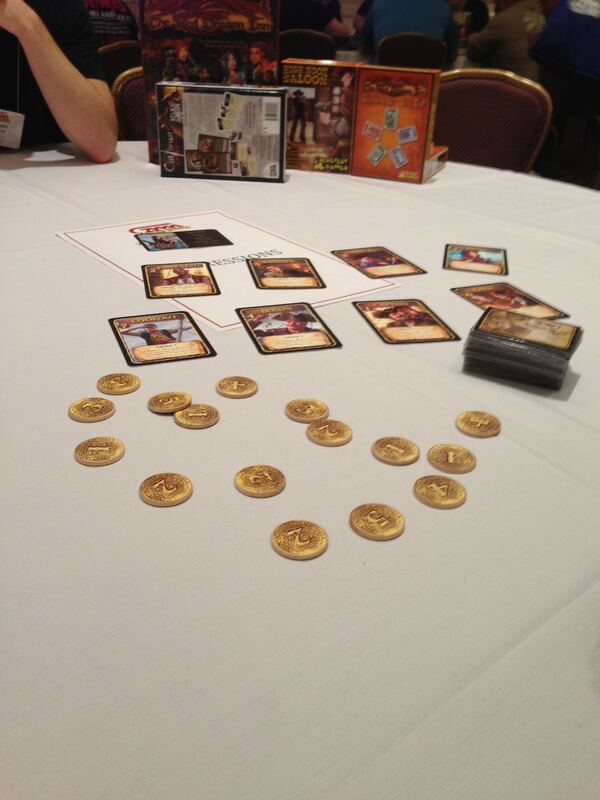 S&D had a prototype game on display “Dread Curse.” Players assume roles of a pirate crew divvying up a pile of treasure. 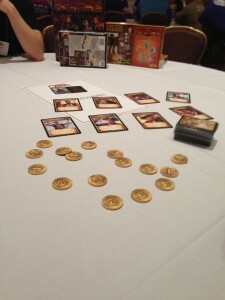 The game combines elements of bidding, Old Maid and screw-your-friend cards. 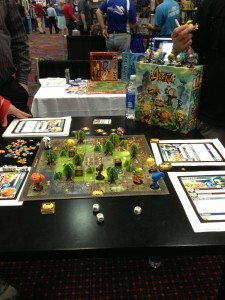 This was a hoot to play and definitely a great party game with lots of player interaction. 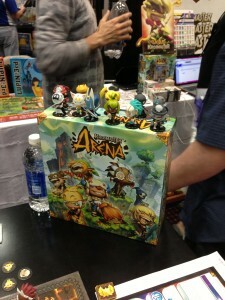 Krosmaster: Arena is a currently kickstarting combat game using adorable little anime characters. Mechanics are pretty standard, with attack and defense ratings for each character. I thought the miniature production values really set this game apart. Ares has several new releases including four new World War 2 planes for the “Wings of Glory” game. These are late-war planes that are much faster, so they come with large maneuver cards. Additionally, the B-17 and Lancaster bombers release soon as well. A new campaign set with rules to advance pilots between missions is planned for the fourth quarter of 2013. 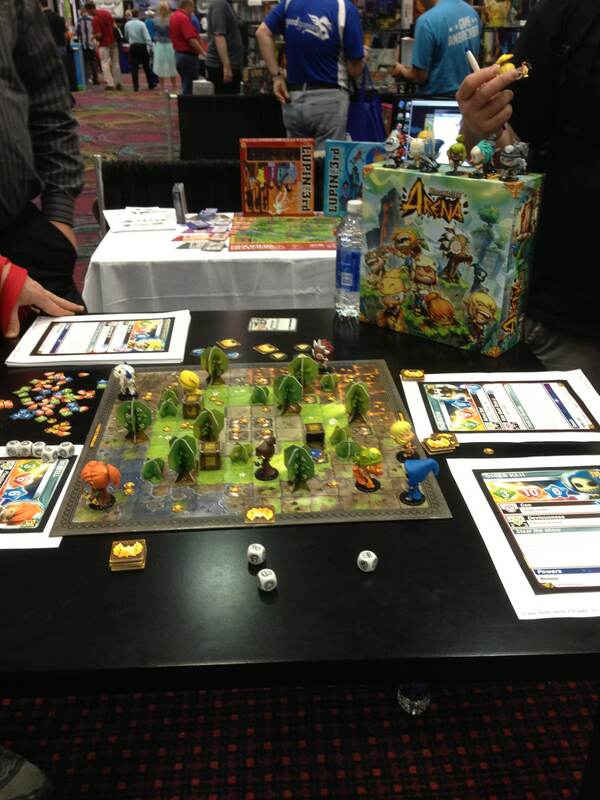 The game is on Kickstarter with a completion date of April 16, 2013 and it will (of course) fully fund. 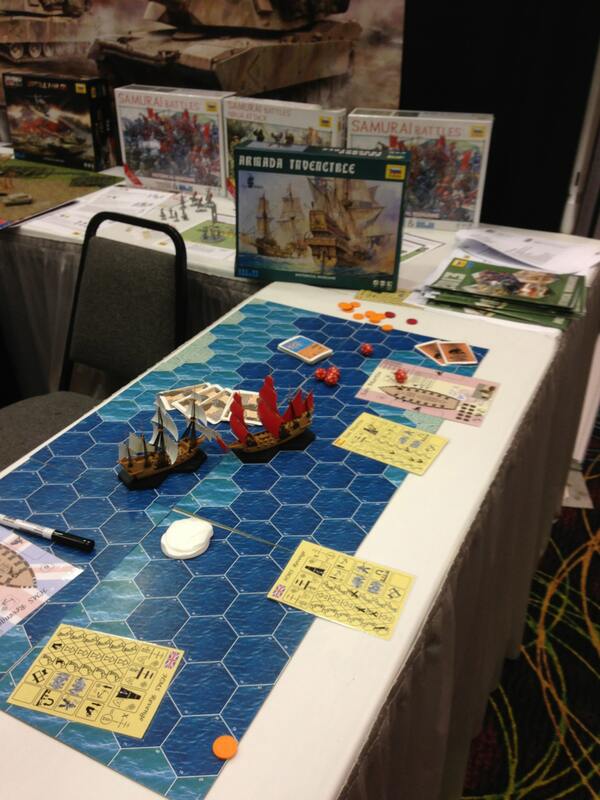 Here is a shot of the prototype box, miniatures and tracking card. 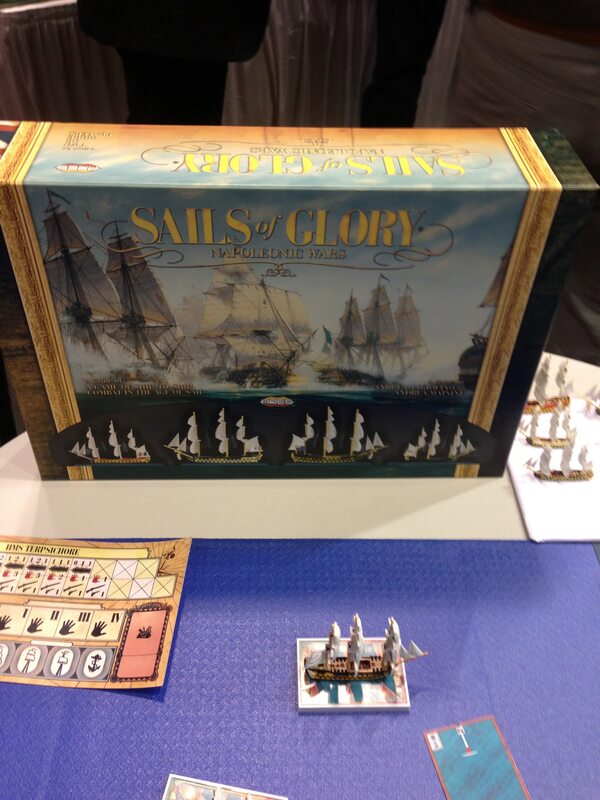 Each ship comes with a maneuver deck and the large card on the left called the “Ship’s Log.” The log lists your ship’s stats and tracks damage as you take hits. Your capabilities diminish as you take damage to specific areas of the ship. SOG plays much like “Wings of Glory” but only uses one card at a time to plan moves. 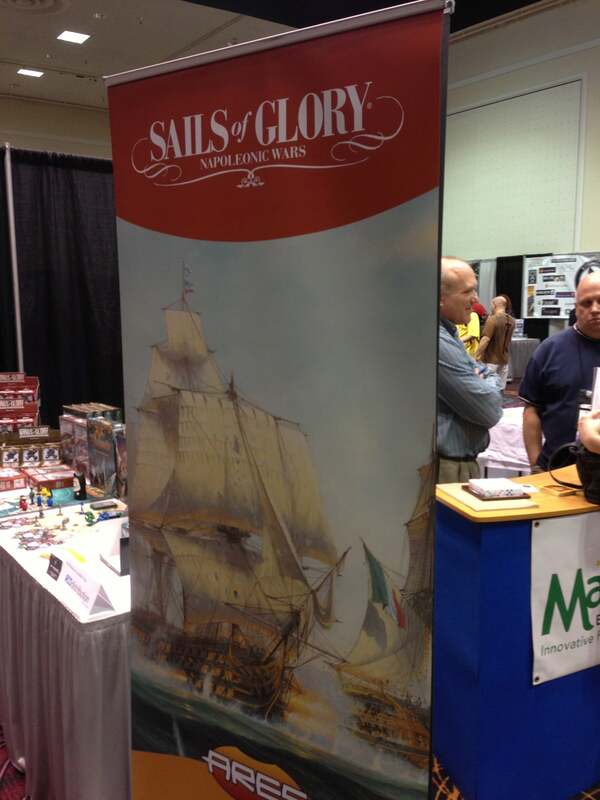 I spoke with Roberto Di Meglio the owner of the company and he stated that the three card maneuver planning was just too complex because of the wind mechanic. The game has a wind indicator (not pictured) that impacts movement. Ships sailing with the wind move faster than those tacking against it. A simple color mechanic on the base determines which moves you can make, depending on the wind direction. 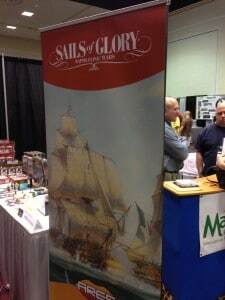 It also impacts turn radius and SOG also adds a “sails aloft” mechanic to raise and lower sails. To shoot people, you get within range, check the firing arc for your cannons and fire away. Here is a close-up of the miniature and the firing arcs. At long-range only cannonballs are available to shoot, but at closer ranges grape-shot and chainshot are available. At point-bland range (less than the width of the range stick) your crew joins the party with muskets! Oh, note the windage indicator in the top right of the photo. I only got a quick demo, but the wind is critical in this game and a small shift can change the battle. The Sails of Glory kickstarter is still up and running and my wallet is itching for this one…. 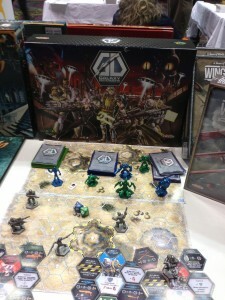 Players move around the board doing battle with various aliens. 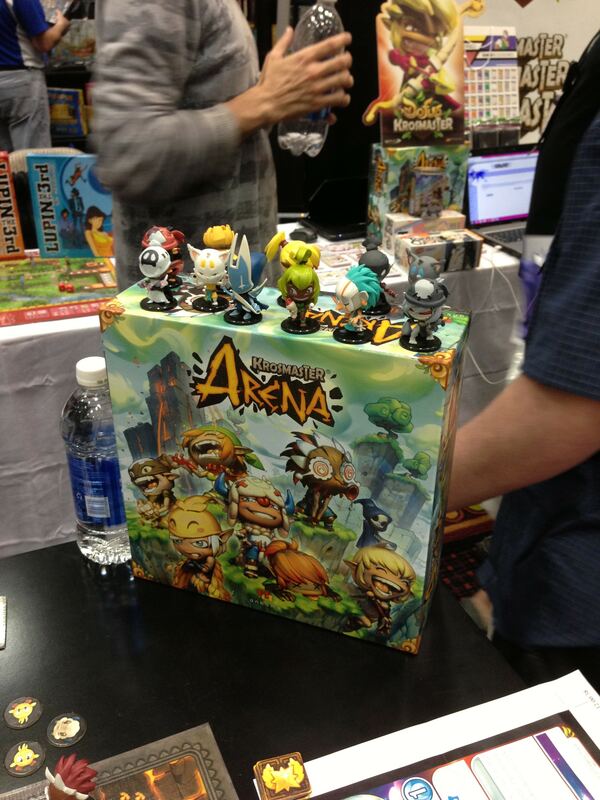 The game comes with five humans and 18 aliens. This is a storytelling, campaign-driven game, so agents advance between games. Check Kickstarter next month for this release.